This post is dedicated to all those horsey people, from around the globe, that have connected with me through Facebook and this blog. As I spend these days mostly on my back, recovering from my crash last Sunday, I have plenty of time for reflection. Almost twenty years ago it was people that drove me out of the sport I loved. Now, as I face another two month set back, when I would expect another wave of discouragement to wash over me, it is people who are keeping me engaged. For most of my life, all that I wanted to do was ride. I studied every good rider, observed every horse I met, put my all into trying to understand everything about horse sport. For me, the horses came first. It wasn’t just about riding and training, but about making them happy, secure, and a willing partner. Early experiences with bad instructors set me studying early the key elements of a great teacher. We had little money, so I took whatever jobs I could to pay for it all. It was always a struggle, but one I adored. I could never afford the latest fashion tack or apparel, and I was never built like a rider – but I was lucky to have a couple of really good trainers help me in my journey, in spite of not having the money to be a full-time student. By the time my homebred Dutch mare, Dani, was coming along, I had some students of my own and felt that I might actually make it as a professional. But life had other ideas. There were two things that finally killed my drive. The first was a series of property changes (we rented then) that left us without facilities for five years. It is difficult to keep momentum when you have only an open, lumpy field and no tractor. It certainly makes teaching a challenge! But, the biggest joy killer were the people in a changing sport. When I started in eventing, then in hunters and Dressage, it felt like a community. People who didn’t know you personally would congratulate you. Some would give you advice after their ride, with little concern they were giving you an advantage. There was always competition, but we were all horse people first. By the mid-nineties, all of that was changing. I would stand watching a competitors Dressage ride, studying technique, quality, etc. Fellow competitors would be standing near by talking about who the rider was sleeping with, how tacky and cheap her boots or saddle looked, or just how snobby she was. The country club set was taking over! These people had always been there. My trainer had a rich clientele who thought nothing of literally stepping between me and him, while we were in mid conversation, backs turned to me. But they had been the minority in the past, and never “in control” of the industry. I was getting frustrated as the tide turned toward a social culture I would never fit into. The tipping point came at a nationally sponsored instructor’s seminar. My mare was just coming back from a layoff, so I took my hunter-turned-Dressage-schoolmaster. A fabulous, lovely horse – but he was an uncolored Appaloosa with long low gaits. On the morning of day two, I cheerily greeted my fellow attendees and received a silent “Who are you? !” glare, as they turned and walked away. It happened that a kind older gentleman had his horse go sore on day two, and with my homebase closer than anyone’s I offered to loan him my gelding and bring my mare over. At the point, I’d spent two days treated like a stablehand, so why not at least get a couple of lessons with my mare? So, I show up with a tall elegant “ballerina” of a mare, who floated through the most complicated exercises. The head instructor and his wife openly admired her beauty (if also the difficulty, since she was a bit hot). Anyone who has been around the horseworld for very long can probably guess what happened next. Suddenly, I was asked for advice by other attendees, asked about coming for clinics, and greeted with a bubbly “Good morning!” … all by the same people who wouldn’t acknowledge my existence the day before! Many would have taken advantage to further their name, and maybe I should have. But, for me, it was supposed to be about my knowledge and skill. I’d worked for decades to show what I could do – but in the end it all came down to my weight, my attire and how fancy my horse was or wasn’t. Frankly, I was so tired from all the struggles to reach that point, that the wind just went out of my sails. Life happened, and several years went by with me just dabbling as I felt like it – but I never felt the same level of commitment. Finally, a couple of years ago I decided it was time to commit or sell the horses. One of my first forays back into the Dressage scene was a wonderful symposium in Tucson. As inspiring as the presenters were, I found that the types of people who drove me out had only multiplied! That is where all of you came in. In the two plus years since I decided to get serious again, I have met with a series of setbacks – injuries, illness, interference from life. Finally feeling optimistic that I could get on a roll, I am once again on a two month setback. But something is different this time. Instead of feeling discouraged and considering whether it’s all senseless, I am still fully engaged and anxious for the time to pass. That, my online friends, is largely due to all of you! You inspire me. You engage me. You share the joy of truly lovely riding, and the sorrow at the horrific things done in the name of horse sport. Instead of making me feel like an outsider, you make me feel like I have finally found a community of the kind of equestrians I grew up with, enjoyed and admired. So, once again, thank you all for caring about horses, and proving it everyday! And thank you for inviting me to join you on a shared journey of education and joy! May we succeed, as a group, in keeping the art of Dressage alive! 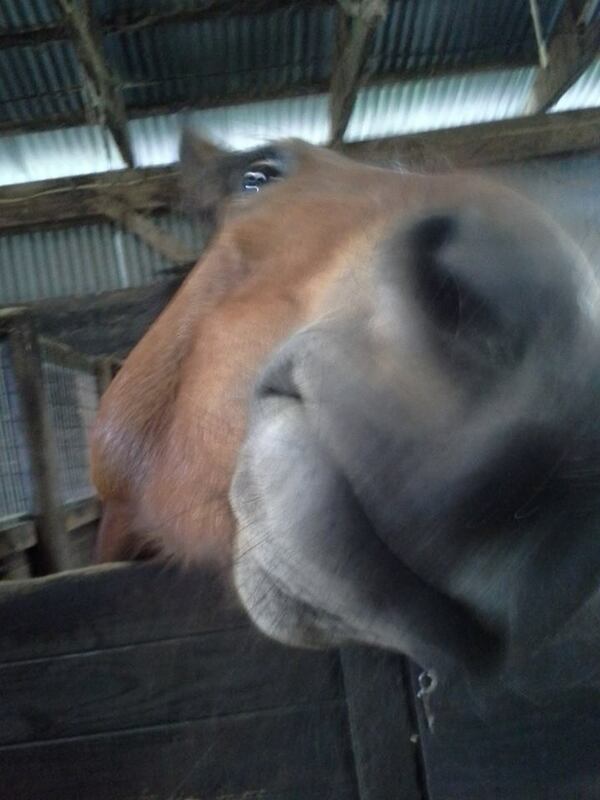 Be good to your horses, and give them treats for me, since I cannot yet give any to mine! This entry was posted in My Journey, Thinking Out Loud and tagged accident, Ben, blogging, community, Dani, Dressage, equestrians, Eventing, Facebook, friends, horsemen, Hunters, inspiration, making connections, motivation, my journey, personal history, quitting, recovery, snobbery, Tally. Bookmark the permalink. 4 Responses to Thank you for being a friend! This post – wow – you have just written down my every thought! I know the feeling so well, never being fancy enough for the sport… and missing how it use to be, when everyone (almost) knew that horses are family! Your English was just fine – beautifully stated, Heidi! Thank you! This was a very inspiring read! What a journey. And what luck that you came out on the right end! Always love reading your thoughts. Thank you, Elinor! I always enjoy your comments and reading about your journey as well!